I wasn't quite sure what rating to give this book. Some letters were 5 stars, some 2... This is the second of the "Women of Letters" books I've read and, overall, I enjoyed it. Some of the letters had me in tears and others were a bit intense for the mood I was in when I read it. All the letters were interesting and offered an insight into the author that we wouldn't otherwise know.There is a fascinating variety of topics, and some I've been tempted to answer myself (no idea if I will do that, though).This is also a great book to read over time, picking it up, reading a letter or two, and putting it down again to continue another day.This will be the "Book of Letters" for the PopSugar Reading Challenge. It took me a long time to finish this book, and I think it's because I struggled to engage with many of the letters. The quality of the contributions is mixed - some are really excellent, but others are meandering and self-indulgent, seeming to try to hard to be meaningful and important. Many of the best contributions contained a healthy dose of self-deprecating humour, even when they dealt with serious or sad topics. I may have made a mistake trying to read this from start to finish - it might well be better suited to being dipped into periodically. In the end, while I enjoyed or was moved by many of the letters, the collection as a whole didn't work well for me and I was relieved when I finished it. 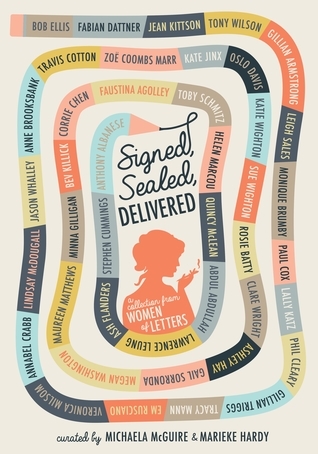 A triumphant celebration of the art of letter writing; reminding us of the time-honored tradition of composing, sending, and receiving a handwritten letter. There is something voyeuristic about the reading of a letter in this manner, even those designed for such public presentation. But it is the intimacy of the moment that lingers ultimately, long after the pervasive sense of eavesdropping dilutes. Michaela McGuire Marieke Hardy - Michaela McGuire's first book, Apply Within: Stories of Career Sabotage, was published in 2009. She writes a weekly blog for The Monthly called Twirling Towards Freedom, and her Penguin Special A Story of Grief was published in 2013.